This is a rare find. 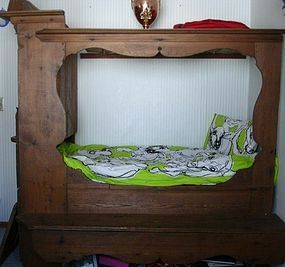 A wooden unpainted Cupboard Bed from Varmland Sweden. I bought it from a Scandinavian Antique Dealer over 20 years ago for my 3 year old daughter's room. She has used it since. It is very old Circa 1700 and likely was the Bed and Cupboard for a Swedish Farm Family. There is some wear as would be expected. The cupboard doors are off but could be reattached with predominantly original hardware but may need a new bit as well. It measures approximately 72 inches tall to top of Cupboard 52 inches deep including bench and approximately 69 inches long. I had a custom twin mattress made for it. These are very rare. The only others I have seen are in The Norwegian American Museum in Decorah IA and the Swedish Institute in Minneapolis MN.